The Pro Bowl happened yesterday, with a final score of Whatever to Who Cares. The most interesting part of the game was when Bills linebacker Lorenzo Alexander actually tried for a few moments and laid into Seahawks tight end Jimmy Graham, in a one-score game with less than two minutes left. Graham was pissed. Alexander hit Graham hard, but it shouldn’t be surprising that he did so. It’s football, after all, and that’s not meant with a “man up” undertone. Although the participants more or less agree to not actually go after each other with full effort, it’s difficult to take the instinct of tackling someone out of a guy who has spent 10 years professionally tackling someone. It’s also tough to tackle someone without harming them in a regular game, as many instant replays have shown before. Why would this half-assed exhibition be any different? Graham has every right to be mad: He could have ended up in a situation similar to that of Bengals tight end Tyler Eifert, who hurt his ankle in the 2016 Pro Bowl and missed all of the offseason. Eifert vowed never to play in a Pro Bowl again if he were voted in. Graham, who ruptured his patellar tendon during the 2015 season, probably didn’t feel like spending more of his otherwise free time rehabbing from an injury. The game continued with no one hurt. A pass intended for Graham bounced off his hands, and Alexander picked it off for a cool interception that included a lateral to Aqib Talib. 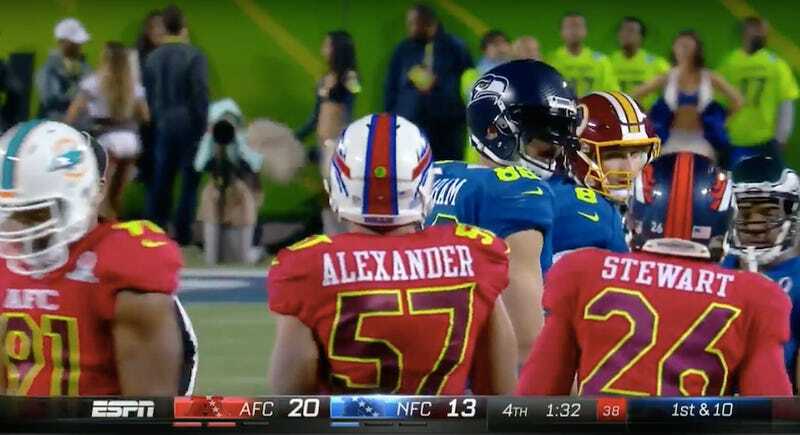 Alexander was named Defensive MVP of the game, and his team’s players each received a relative pittance of $61,000. Graham, who was on the losing team, received $30,000.